ADDRESSES HOUSE OF PARLIAMENT IN JAMAICA, April 1966. Distinguished members of the Jamaican Parliament, I am glad today to get this opportunity of conveying some thoughts to the Jamaican Parliament and people. The people of Jamaica have a long glorious history. The Jamaican people have struggled to attain their independence and since independence the Jamaican people in an exemplary national unity have gone on to bring further abundance and progress to themselves. Because I know of the history of these wonderful people and because I know of the sentiments the people of Jamaica entertain for the Ethiopian people, I have always wished to come and visit Jamaica. Now, thank God, this wish of mine has been fulfilled. Upon arrival in Jamaica, I have seen more than I have expected. I have seen the progress of the people and I have seen their determination to march forward in unity towards greater progress. I have also witnessed personally the extent of the feeling of the Jamaican people for the Ethiopian people. Again I wish to take this opportunity of expressing my thanks to the Government and people of Jamaica for the wonderful reception that was accorded to me. Our relations with the Jamaican people, as I have said already, is not of present origin. At a time when the Ethiopian people bore aggression, harsh aggression, the people of Jamaica showed their concern and sympathy to the Ethiopian people and have in this way provided us with encouragement regarding which the Ethiopian people shall be forever grateful. Since I arrived in Jamaica, I was able to witness myself that these feelings of sympathy that had existed then have continued, and even now there is a greater desire to establish a closer relation with the people of Ethiopia. The relations, in a broader sense, between the people of Jamaica and the people of Ethiopia and Africa are deep and abiding. We have all struggled for independence and have achieved it now...We have attained an objective that is the basis for continued mutual cooperation and goodwill. In addition to this, there is a bond of gratitude, a bond of brotherhood. The people of Jamaica, by and large, have originated in Africa. This again gives us another basis upon which we can contract a healthy relation, a relation that is not only going to be useful to our respective peoples but a relation, because of the fundamental similarity between us, that will in the long run contribute to a better maintenance of international peace and security. In addition to this, both the people of Jamaica and the people of Ethiopia are dedicated to anothers cause, that is the cause of progress and prosperity. Here again the struggle we have to undergo, the difficulties we must all overcome, and the programs we must adopt have much similarity. Thus I say, the people of Jamaica and Ethiopia have much in common and these common factors can be used as the basis for even stronger relations between our two peoples. The people of African origin have immigrated to many parts of the world. Some of them have come to Jamaica; others to other parts of the world. But wherever they may be they have similar historical experiences and the problems that await them depend on sympathy, and this can be used by all of us as the basis for the establishment of greater cooperation which will be for our mutual benefit. In addition to this, I also believe that the peoples of Jamaica and Ethiopia have another important cause in common, that is the cause of international peace. For much more than means of warfare, the violation of peace somewhere, must be discouraged to prevent the utter devastation of the human race. We have as an important concern that there should not be a violation of international peace and security. However, if small countries do not combine all their energies, if small countries do not put all their weight in one direction towards the maintenance of international peace, then their individual voices in today's world would not matter much. This is precisely why the smaller states, like Jamaica and Ethiopia, have the supreme interest that international peace and security be preserved. And to this end we have to continue to collaborate so that our voice on the international scene would be augmented. In addition to this, it is quite true that a country can achieve material progress alone. However, we know from the experiences of the past that international co-operation tends to quicken the pace for progress of individual countries. This is again another area for us to think about and see in what way we can further expand the relations between the peoples of Jamaica and Ethiopia. From another fundamental point of view this is why the Organization of African Unity has been established. It is because the African continent, which comprises more than 250 million people, were it to remain divided among more than 30 states, their individual voices would not carry weight. It is precisely why, since there is an identity of interest, we have attempted to include Jamaica also, so that we can carry this weight in the councils of nations, and also through the process of co-operation and expanded economic relations we might be in a position to quicken the pace of development of the individual member countries of the Organization of African Unity. Because the African people are dedicated to the cause of the maintenance of peace, because the African people are determined that there should be that material progress for their people, and because the African people believe in the essential precepts of democracy, these are the foundations of the Organization of African Unity. An organization that is based on such a solid foundation can only bring success to all its endeavours which will be for the interest and benefit of the African people, and perhaps also the interest of other peoples. From the same point of view I say the similarity of fundamental national interest between our two peoples, that is our good friendship that has always existed, must be allowed to deepen, must expand the areas of material and full cooperation in all ways possible. We must remember that many states that today represent the major powers of the world were once weak, were once prey to other major forces. But, however, through the process of assimilation, through the process of the realization of fundamental national interests, and through the process of combination that they have achieved, they have become the major powers, the powers that are all-embracing. From the same point of view the people of Africa in Jamaica who have identical interests should be able to augment their energies for good by the process of the establishment of greater collaboration. I would broadly say wherever there is African blood there is a basis for greater unity. We must also help each other in our endeavours to expand education, to raise the standard of living of our respective peoples. 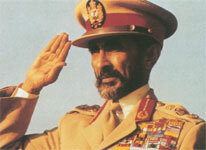 To this end we wish to signify the appreciation of the sentiments held by the Jamaican people for the Ethiopian people and as a manifestation of our sincere friendship, within our very limited means, we have made an agreement with the Jamaican Government to establish a school for Jamaicans here. I am confident that all the preliminary procedures will be concluded so that the construction of the school will commence within the near future. Lastly, may God give wisdom and His blessings to the people of Jamaica. Thank you.